In the 32 years between 1983's Star Wars: Episode VI - Return of the Jedi and last year's Star Wars: The Force Awakens, Harrison Ford has often spoken about how he originally wanted his Han Solo character to be killed in Star Wars: Episode VI - Return of the Jedi. Franchise creator George Lucas ultimately decided against it, which allowed Harrison Ford to return as Han Solo in Star Wars: The Force Awakens, helping the sequel earn over $2 billion at the box office thus far. The actor finally got his wish, with Han Solo being killed off by his villainous son, Kylo Ren (Adam Driver). But during a new interview with BBC, the actor teased that Han Solo could actually return in future Star Wars movies. Here's what the actor had to say below when asked if he'd ever reprise the legendary role. "Anything is possible in space. I wanted Han Solo to sacrifice himself for the good of the other characters to bring some gravitas to the story." Production is currently under way in the U.K. on Star Wars: Episode VIII, under the direction of Rian Johnson, but there has never been any confirmation that Han Solo will be featured in any way. Of course, he could be used for a flashback or perhaps he could show up in another one of Rey's (Daisy Ridley) "visions." In Star Wars: The Force Awakens, Rey had a unique vision after she touched Luke Skywalker's lightsaber, given to her by Maz Kanata. Given the bond she formed with Han Solo in that movie, it's possible that he may show up in one of these visions, perhaps to offer some guidance, but that's only speculation. Here's what the actor had to say about his experiences working on Star Wars: The Force Awakens. "I was very pleased to have the opportunity to work with the other characters, to work on a script that I had real confidence in, with actors that were a dream to work with, with a director that had a very sure and generous hand, and it was altogether a pleasure. I hope I bring an emotional understanding of the characters and something the audience will recognize. I want the audience to experience the character, not to feel that they know him but to be involved in seeing what happens to him." It's also worth noting that, back in January, a casting report for Star Wars: Episode VIII revealed that Harrison Ford will return as Han Solo in the sequel, but the actor wasn't mentioned as part of the cast when shooting got under way. While it remains to be seen if Harrison Ford's Han Solo will return at some point, fans will get to see an origin story for the character in the spinoff Star Wars Anthology: Han Solo. We reported last week that the casting search is down to just a handful of finalists, including Alden Ehrenreich, Jack Reynor, Taron Egerton, Miles Teller, Ansel Elgort, Emory Cohen, Jack O'Connell and Blake Jenner. 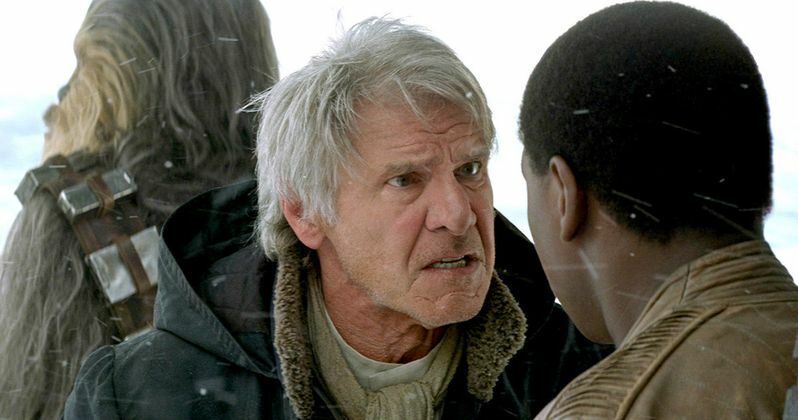 Do you think Harrison Ford's Han Solo should return at some point?